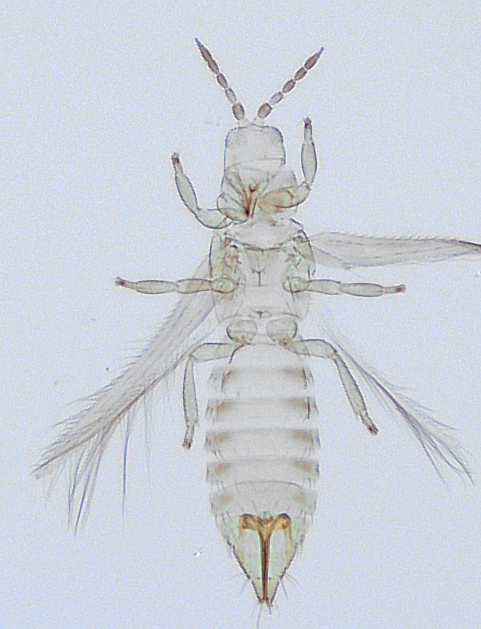 Female macroptera. Body and legs usually yellow, abdominal tergites sometimes with paired pale brown shadings laterally; antennal segment I white, II–III brownish yellow, IV similar but with apex shaded, V–IX pale brown; fore wings very weakly shaded; tergite IX major setae pale and conspicuously thickened or spatulate. Head with weak transverse anastomosing striae behind eyes, sometimes extending into ocellar triangle; all setae spatulate, ocellar setae III within or on anterior margins of ocellar triangle; eyes without pigmented facets. 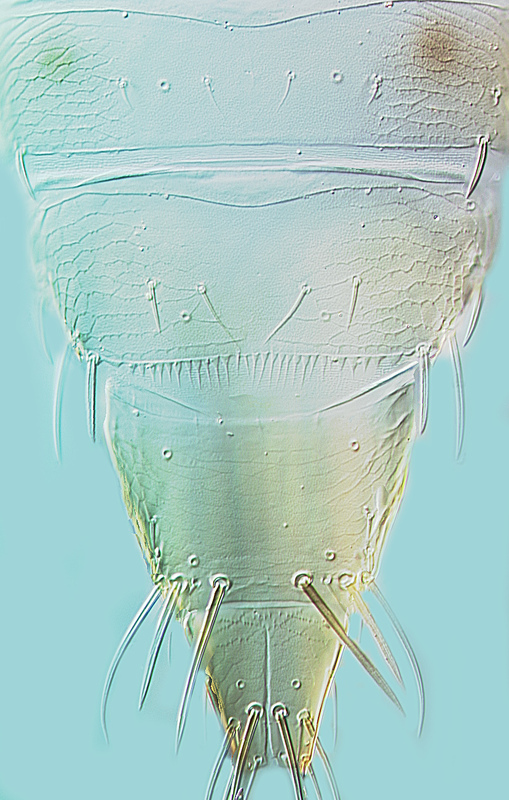 Antennae 9-segmented; segment II with 2 dorsal setae spatulate, III–IV with small forked sensorium; VI not pedicellate, suture transverse between VI–VII. Pronotum with irregular transverse lines, all setae small, strongly spatulate. Mesonotal setae strongly spatulate. Metascutum irregularly reticulate; median setae strongly spatulate, lateral setae setaceous; campaniform sensilla present. Fore wings including clavus with setae strongly spatulate; first vein with 9–10 setae basally, 2 setae medially, 2 setae distally; second vein with about 16 setae including 1–3 basal to vein fork; clavus with 5–6 marginal setae and one basal seta. Abdominal tergites III–VII with no sculpture medially; laterally with anastomosing striae with small microtrichia; tergite VIII with long regular comb, microtrichia with wide bases; tergite IX setae S2 stout. Sternite VII median setae well in front of margin, S2 almost on posterior margin. Male macroptera. 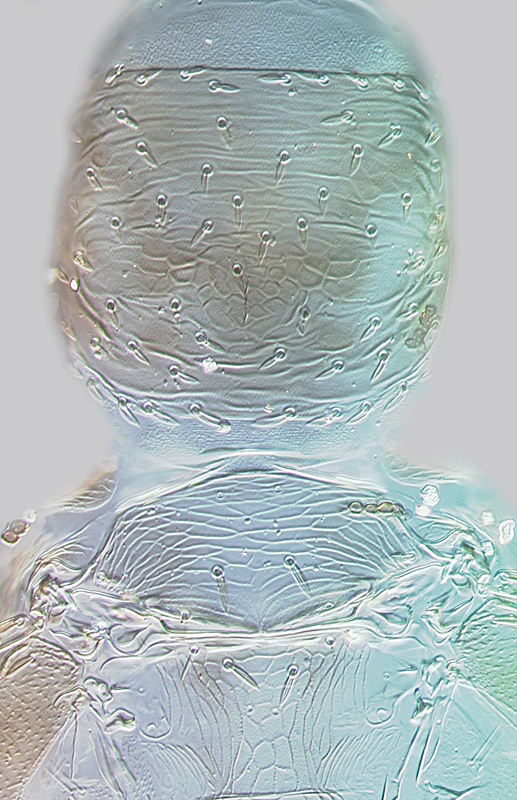 Similar to female, but major setae less thickened, sometimes almost setaceous; abdominal tergite IX medially with one pair of short, stout setae; sternites III–VII with C-shaped pore plate, often large but sometimes small or on sternite III almost transverse and even subdivided. There are 43 species of Anaphothrips known from Australia, out of a total of 79 species worldwide (Mound & Masumoto, 2009). Many of these species have the antennae clearly 9-segmented, others clearly have only 8 segments, but several species have an intermediate condition with segment VI bearing a partial and often oblique transverse suture. The major setae of A. exocarpiare distinctly flattened and spatulate, but populations taken in Central Australia have these setae more slender. Australian Capital Territory, South Australia, New South Wales, and Northern Territory. Exocarpos spp. (Santalaceae), particularly E. cupressiformis.